Dave Kobrenski: Kassa Flute Co. 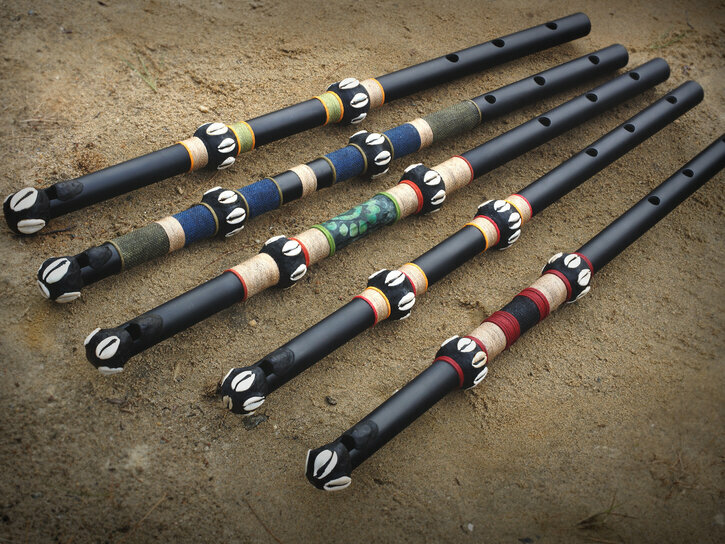 The Kassa Flute Co. specializes in making high quality flutes known in West Africa as tambin or Fula flutes. For the past decade, I have been fortunate to have the opportunity to study the traditional flute of the Malinké in West Africa with a master of that tradition, Lancine Condé. In addition to an ongoing effort to learn, document, and preserve the traditional music in Lancine’s extensive reportoire, I learned to make these beautiful flutes as an apprentice flute-maker to Lancine. 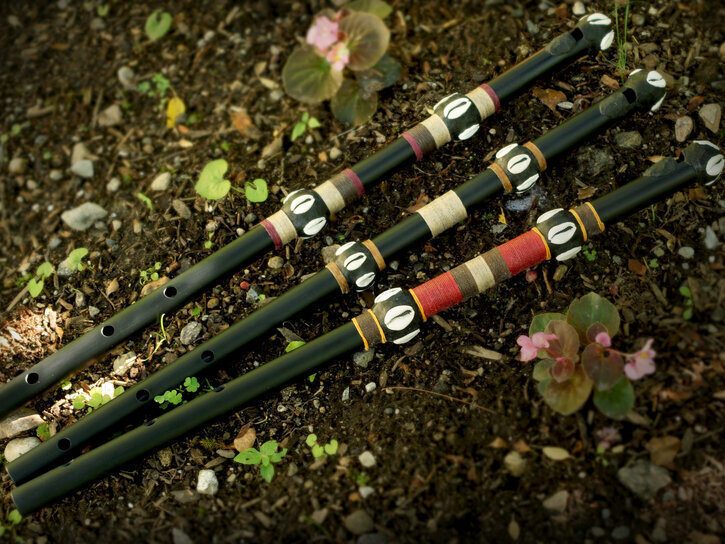 Together, we formed the Kassa Flute Co. to introduce this wonderful tradition to a larger audience. Below are a few of the flutes I have made recently. You can also hear these flutes on the new AfroFlute project recordings, as well as on the Conakry Sessions recordings, featuring Lancine Condé and myself. The tambin likely originated with the Fula (or Peuhl) people, who live throughout West Africa, with large populations in Guinea and Mali. Their flutes are also used in the traditional music of the Malinké people in Guinea, as a result of their living in close proximity with the Fulani for many centuries. It was from Malinké musicians in Guinea that I learned the craft of playing and making these flutes, in particular from Lanciné Conde, a master of the tambin originally from the Kouroussa region of Guinea, as well as Mamady Mansaré IV (the son) and others. Although it has existed for ages in West Africa, the tambin is a little-known instrument throughout the rest of the world, although it is slowly gaining attention for its characteristic rich sound and unique voice. Musicians like Mamady Mansare III (the father) first brought attention to the instrument through his playing with the Guinea national dance companies, Les Ballets Africains and Ballet Djoliba. The international group Fula Flute demonstrated the versatility of the instrument with their virtuoso performances of traditional songs for the flute. A growing number of contemporary African musicians, like Dramane Dembélé, Oumou Sangare, Issa Bagayogo, and several others have featured the tambin in their recordings. My own groups, Landaya and Donkilo! Afro Jazz Orkestra feature the tambin heavily. In West Africa, the tambin is normally constructed out of a thick, woody vine that grows along the banks of parts of the Niger River. The vine has sturdy outer walls and is entirely hollow, making it the perfect material for a flute. I have also seen tambin flutes in West Africa constructed out of metal pipe and pvc tubing, and these flutes sound remarkably similar to the wooden flutes (and in fact it is nearly impossible to tell the difference based on sound, especially given the great variety of “voices” that can be created due to the natural variances of the wooden vine itself). 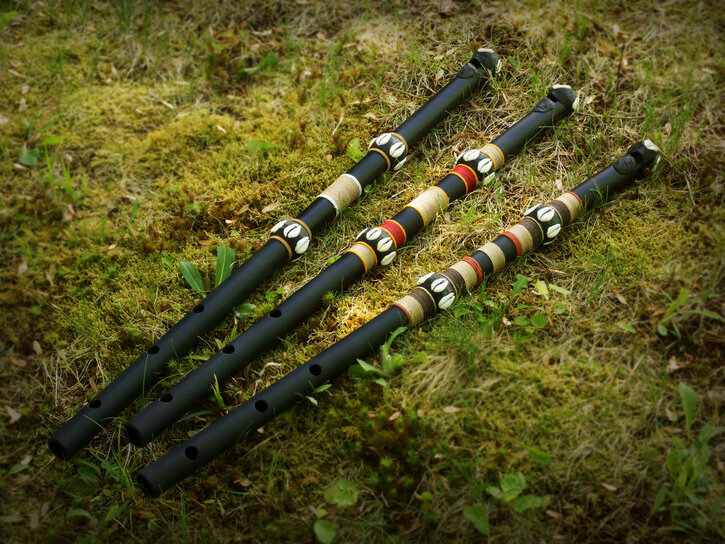 A transverse (or side blown) flute, the tambin consists of only three holes, but has a range of two and a half octaves, achieved by overblowing, and has four distinct “registers”. The embouchure is formed out of a special substance knows as bee cerumin (a natural blend of beeswax and propolis made by tiny, stingless bees) that is a black color and can be easily shaped to help direct the passage of air into the hole. The cerumin, sticky when heated, dries to a hard consistency (due to the high level of propolis); that said, when playing the tambin for long durations on hot summer days, the embouchure can soften somewhat, so care must be taken! Traditionally, the tambin is tuned to what would be called an equidistant heptatonic scale – that is, a seven note scale where all intervals are roughly equal. I say roughly because the tuning depends on the ear of the flute maker, who, without modern tuning devices, creates the flutes to produce the traditional songs and melodies of his particular region; variances from region to region in how these musical intervals are heard can certainly be found. The equidistant scale is an ancient scale indeed, and while it is tempting for the Western musician to characterize this scale as being “out of tune”, it is important to note that this tuning is quite deliberate and actually quite precise: the traditional songs of the Fulani and Malinké played with a Western scale would not be the same songs at all. The tambin flutes are most commonly found in the keys of G and F♯ (G♭) (approximately, because of the equidistant nature of the scales). Since the flute is often played with the balafon, the two “sizes” of flutes are relevant to whether you are playing music with a large balafon or a smaller balafon, which would also be tuned accordingly (many other turnings for the balafon exist and I don’t mean to generalize here; I’m speaking specifically of Malinké instruments that would be found in the Kouroussa region of Guinea). Further, I have seen two models of the Ab flute: a smaller one beginning on the pitch of C, and a slightly larger one beginning on Bb. While they play the same scale (just shifting the range), the determination of which starting note is used is likely decided by the size of the vine itself. While I haven’t encountered flutes tuned otherwise in this region of Guinea, I have met other players, from Burkina Faso, for example, who also have a larger flute tuned to F (and starting on the pitch of A) that is quite beautiful.